This week saw the launch our latest site in conjuction with London-based AOK Corporate Events. 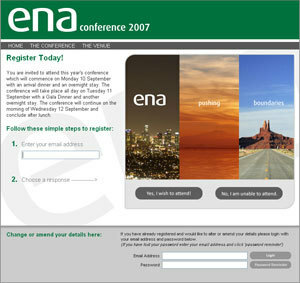 The site is a conference registration system for Halifax Bank of Scotland PLC‘s 2007 ENA conference. The system incorporates a full delegate reporting and data export facilities. It was constructed using .NET version 2 incorporating a three tier development structure.